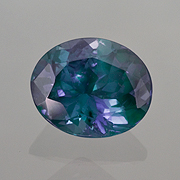 Fine alexandrite with teal hue. Color change to raspberry. AGL cert. Measurements:	8.44 x 6.94 x 4.62 mm.